The Yatra SMART choice property comes with a promise of 8 assured amenities, money-back guarantee and priority helpline support. 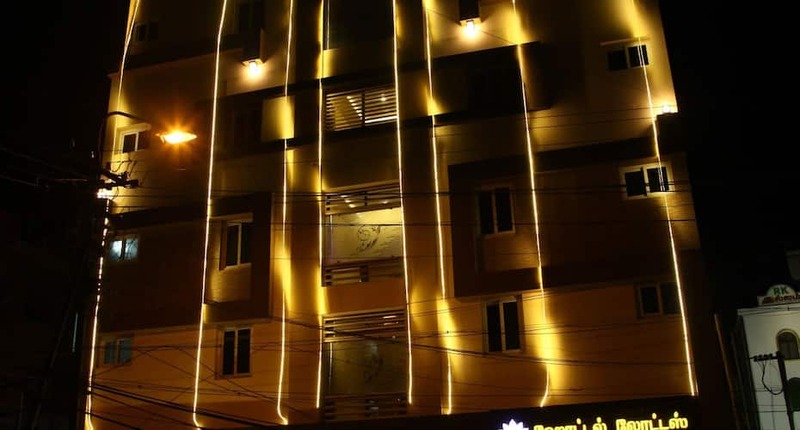 You also get free cancellation and standardized prices through the year.Placed at a mere distance of 0.5 km from Madurai Junction Railway Station, Hotel Lotus is a value for money accommodation in Madurai, featuring an on-site restaurant and offering complimentary conveniences like Wi-Fi access and breakfast service. The Meenakshi Amman Temple is a known tourist spot and landmark, situated 1 km away from the premises.This four-storied property comprises a total of 29 spacious rooms. The rooms are equipped with requisites such as temperature control system, welcome amenities, mirror, wardrobe, balcony and en-suite bathroom with toiletries.Hotel Lotus features a business center, 24-hour front desk, travel counter and secured parking space. Additionally, conveniences such as room service, currency exchange, power backup facility, medical aid and valet parking are also provided.Local tourist spots include Koodal Alagar Temple (1 km), Thirumalai Nayakkar Palace (3 km) and Madakulam Kanmai Lake (6 km). This hotel in Madurai is accessible via travel hubs such as Mattuthavani Integrated Bus Terminus (7 km) and Madurai International Airport (12 km). Reason For Rating : Good location,good staff.neatness.cleaning. What needs to improve : Nothing serious, mug wasnt provided in the bathroom when we checked in. We got that when we asked the staff. Reason For Rating : Nice hotel to sray, close to meenakshi temple. Reason For Rating : Couple of issues: My requirement was just to refresh by checking out at 6 AM and checking out same day by 8PM, but the hotel showed no flexibility for this need rather insisted to book with overnight charge and an extra early-checkin charge of 1000. Even after doing all these, someone from the management called and was asking to give the keys earlier with no refund or so. The photo showed in the site while booking had 2 beds but the room we got had only one. Also the room was too small. Reason For Rating : 1) To step into bathroom aged people like me got to strain heavily. Infact escaped a fall .Room Floor to bathroom floor height is too much.2) Reception is really nice needs appreciation. 3) Ceiling Fan - when it remotely controlled , controller has to be given to the guest. 4) Car parking is a problem as my call taxi couldnot be parked more than 3 monts. to go to airport. What's Good: The location, which is very close to the Meenakshi Amman Temple. Reason For Rating : It was a fantastic stay at the hotel for our parents. I would like to extend a special thanks to Mr. Nawab Khan from the Hotel Administration; who made all the reservations for Airport pick up and drop off, and other such arrangements without much hassle. He has always been very prompt in replying to an query that I had. Reason For Rating : Overall experience was excellent..
What's Good: Overall stay was good, room service is expensive, breakfast was really good. Reason For Rating : Excellent stay. Rooms are spacious. Though no breakfast at hotel, hotlier provided tokens for the breakfast in the opposite hotel. 24hrs hot water. Meenakshi amman temple is walkable. Near to main road and all the big shops. Reason For Rating : Good Hotel. But service is not upto the mark. Reason For Rating : Cost is slightly on the higher side. Reason For Rating : Very comfortable, near the temple. A little old building but well maintained with cellar car parking. This 2x2double bed rooms are convenient for a family of four.They don't have restaurant but tieup with nearby restaurant is ok. Value for money spent. Reason For Rating : Comfortable two double cozy bedding for a family of three adults and children in the new wing second floor .We stayed for a day was very likable .We enjoyed every aspect of it.There is no ward ropes ,but provided with all dental kit,soap,shampoo,moisturizer for all the four members and complementary 2 one litre branded water and complimentary breakfast for four persons at Shri Sabaress restaurant was awesome.Bathroom was modern.Service back up , reception and taxi service was excellent.Overall it was a great stay.We loved it.We prefer to come back and except for a narrow road.But then it is located in a very convenient place ie., in the heart of the city and very near to Madurai Railway junction/long distance buses and about 10 kms to Madurai International Airport. Reason For Rating : Helpful staff. Hotel is clean . Shopping centre, restaurants, rail way station all is nearby. Reason For Rating : nice hotel in good location. Newly renovated rooms and building. Reason For Rating : Toilets were water logged, no proper sanitation. Reason For Rating : It was good. Clean and good rooms. Reason For Rating : Ok budget lodge. Not a hotel. Close distance to the Meenakshi temple and in the market area. This place is nice for stay and staff is very courteous. We booked the AC room. The cleanliness was also excellent. The place is located conveniently from where you can walk to multiple attractions and food joints. Rooms are Hygiene,well maintained.Deluxe Rooms are bit smaller, Roof of the room is close-by-not even 9 feet.No wardrobes. Reception staffs lack of coordination.Dining hall is under renovation,they Food coupon for two adults even knowing details of family going to stay-Value of the coupon is peanut. Benefit is closer to temple. Not in a good area (too crowded, very small street in front of hotel). Though we had booked, we were told that all rooms are occupied. Eventually arranged an alternative within the same hotel. Not much interaction with staff, arranged a cab to Rameswaram, little expensive but fine. Decent budget stay but learnt that there are many other good hotels around in Madurai with slightly higher cost. This hotel was nice and polite if a bit disorganized. The travel service was not very helpful. The morning pooja was beautiful. Don't bother including breakfast as they send you to a cafe over the road anyway where you can get more choice at a better price. The cafe was a great place for breakfast though! Rooms very very quiet and airconditioning good, but quite small and would be annoying to stay in for more than a few days. Very good location close to the meenakshi temple and everything else. The prime advantage of checking in this hotel is its proximity to the meenakshi Amman Temple. Although the rooms don't look like those in photos. The rooms were neat and decent to stay. The reception staff were very hospitable. The only odd thing was the bathroom was too small.